I just received this email from Mervis Diamond. Apparently their attempt is to use 2 tbs. 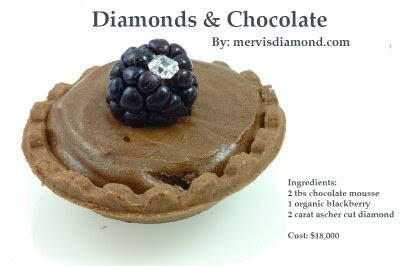 of chocolate mousse and 1 organic blackberry to peddle a 2 carat diamond. It can all be yours for just $18,000. Considering that in this economy chocolate is one of our last affordable luxuries I find this strategy completely preposterous. Not to mention that that is the most unappetizing chocolate looking thing I've ever seen. You're right - the only thing that looks appetizing in that picture is the diamond. Totally unrelated to this post, I came across your blog when I did a search for peanut butter hot chocolate. Do you have a recipe for this? I could not find anything like it here, but for some reason your blog showed up anyway. I was honeymooning in Belize a few years ago and had the BEST hot chocolate...secret ingredient peanut butter! Also, I do not eat white refined sugar...do you have a chocolate suggestion for me? Raw chocolate maybe? Yup, totally preposterous! The thing will sold out even without the diamonds if its looks so yummy in the first place. Having to decide between this and your lion cupcakes I'll surely choose the latter.